Treyarch has released an update for Call of Duty Black Ops 4. The update includes multiplayer game play improvements, zombie fixes, CWL custom game updates and a note on speed cola. The Call of Duty Black Ops 4 update will affect all platforms including Playstation 4, Xbox One and PC. With frustration from PC players mounting it appears Treyarch have mostly targeted PC players in this update. However, there are a bunch of updates for Playstation 4 and Xbox One players as well. For zombies players, they have introduced a modifier to the perk system. The modifier is known as “Speed Cola” and increases weapon reload speed. They have also made stability improvements to prevent crashes. For multiplayer players, they have improved melee hit detection, added enemy attachment information to the killcam and resolved UI issues. They have also changed some settings in the CWL custom games and patched a few bugs that allowed players to use items on their create-a-class that they did not have unlocked. For Blackout players, they have patched a few UI errors that would cause crashing, re-added the fist bump gesture, and adjusted the descriptions of unlock-able characters. Lately, the Call of Duty PC community has felt frustrated with the lack of support. 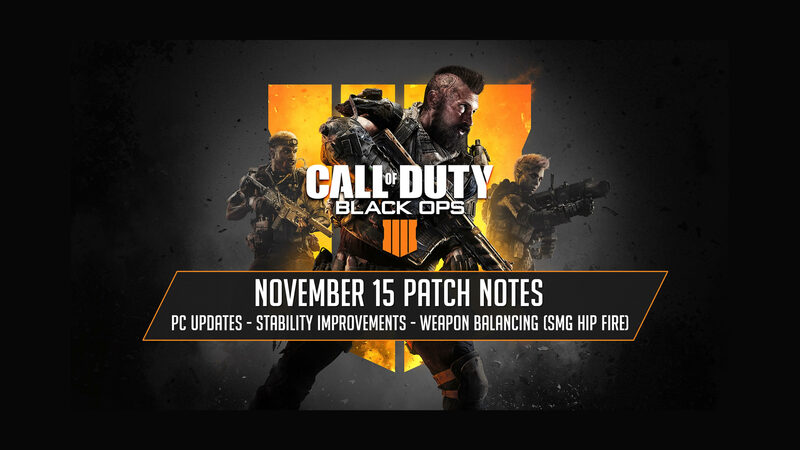 It seems as if Treyarch has noticed this and they released additional updates for PC players. The major changes for PC players are stability and UI improvements, new keybindings and adjusted the balance of some weapons. High Caliber I – Added shoulders to the one-shot kill zone.